It’s Jack Hughes and Kaapo Kakko leading the way, but how is the rest of the 2019 class shaping up? We rank the top 50 prospects for June’s draft. “I skate with [Devils star] Taylor Hall in the summers. He’s been a really good guy to me, really nice. It’s the NHL. I’d be honored to play for New Jersey one day. It’s a great spot,” Hughes said. The Devils’ lottery win continues a bizarre run of luck for Hall in the draft lottery. When he was in Edmonton, the Oilers picked first overall three times. After the Oilers traded him to New Jersey, the Devils won the lottery twice. This year’s lottery was a painful one for Ottawa fans to watch. The Senators finished the regular season with the NHL’s worst record but did not own their first-round pick, which was traded to Colorado in the Duchene trade. They had the option to give Colorado their first-rounder in the 2018 NHL draft, but instead opted to select center Brady Tkachuk with the fourth overall pick. That gave Colorado the Senators’ 2019 pick and the best lottery odds. To add insult to injury, the Senators traded Duchene to the Columbus Blue Jackets in February after 118 games in Ottawa. Hughes rewrote the record books at USA Hockey’s National Team Development Program, blowing past the likes of Patrick Kane, Phil Kessel and Auston Matthews while putting up 202 points over his past two seasons to shatter the previous career scoring mark of 189. He is averaging 2.10 points per game this season with the U.S. national under-18 team amid a mixed schedule of USHL, college and international opponents. Hughes also represented the U.S. at the World Junior Championship this year where he helped Team USA earn a silver medal alongside his older brother and last year’s No. 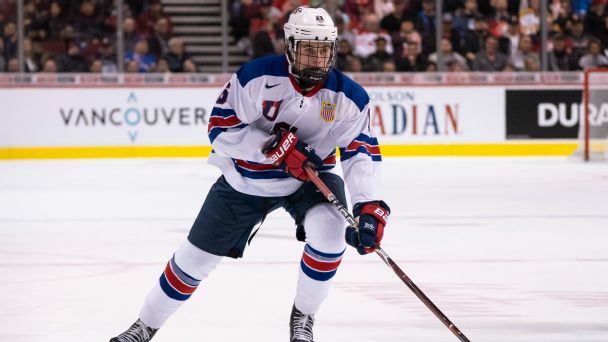 7 overall draft pick by the Vancouver Canucks, Quinn Hughes. After Hughes and Kakko there are several players who could challenge for the next few spots, including Russian winger Vasili Podkolzin, Western Hockey League centers Kirby Dach and Dylan Cozens, WHL defenseman Bowen Byram and some of Hughes’ own under-18 teammates — Alex Turcotte, Trevor Zegras and Matthew Boldy. ESPN’s Chris Peters contributed to this report.